calling all music loving kids! join the amazing Jamie Drake for a late morning interactive music making class. all ages welcome. $20 suggested donation. 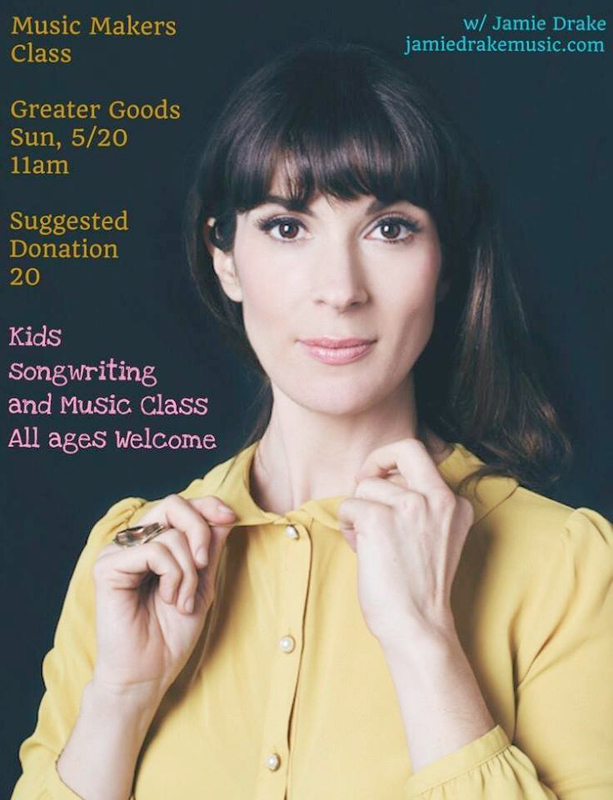 jamie will be performing saturday night (5/19) at greater goods at about 8pm if you’d like to come out & hear her in action. For nearly a decade, Jamie Drake has been a hidden gem within the Los Angeles folk scene. Having sung alongside and collaborated with artists as varied as Jim James, Peter Yarrow (Peter, Paul and Mary), Moby, Ed Helms, Glen Phillips, Sara and Sean Watkins (Nickel Creek), Willie Watson, Susanna Hoffs,Tim Robbins, in addition to frequently lending her voice to film and television (she co-wrote and performed the theme for the upcoming CW show, Life Sentence), Jamie now turns to her own solo efforts with the forthcoming release of her sophomore album, set for release in late 2018. In it, she mixes her folk traditions with modern sounds and adds a generous dose of adventure into uncharted and original musical territory that is wholly her own. With family roots that include traveling gospel singers, a country songwriter for a father, and a singing nurse for a mother, Drake was bound to be musical. Her first instrument was a piano that she’d come home to after school and play by ear. When the piano fell off a moving truck, she took up the guitar, learned a few chords, and wrote her first song at 17. Songwriting became a therapeutic outlet for Drake. She grew up in an intense family environment that included moving around the country and constantly being uprooted. Drake discovered a certain kind of joy in musical theater, and attended The American Musical and Dramatic Academy in NYC after high school. Marrying at the age of 21 and a house wife for most of her 20’s, she worked as a stylist in music video productions with her director spouse. When the marriage split amicably, she found herself thrown into the life of an artist overnight and took on both the hope and the burden of pursuing musical truths needed to be created and told with the fervor of someone who had been given a second chance at life. Her 2010 debut, “When I Was Yours,” reflects on this loss with honesty and hope. Eventually her love of folk music and musical theater came together in her starring roles as folk heroes (Joan Baez, Judy Collins, Sis Cunningham) in the off Broadway folk musical, “Lonesome Traveler.” The New York Times said she quietly claimed the show’s best moment while embodying Judy Collins in a revelatory version of “Turn, Turn, Turn.” She has had a heavy and varied output of material since her debut, helping spearhead various projects and releases (Nobel, Dear Lemon Trees, The Bitter Branches) and looks forward to the release of the culmination of all her work this year in “Everything’s Fine,” co-produced with long-time collaborator, AJ Minette.